The project “Of Unwanted Things and People” by David Súkup, Ivana Laučíková, Leon Vidmar & Agata Gorządek and co-produced by Maur Film (Czech Republic), Artichoke (Slovakia), ZVVIKS (Slovenia) & WJTeam/Likaon (Poland) was awarded the Eurimages Co-production Development Award at the Cartoon Movie (Bordeaux, France) on 7th March 2019. The story of two orphans and a magical cat is a modern, short puppet film set in the present day, based on Arnošt Goldflam’s book Of Unwanted Things and People. The four-country coproduction won the first animated feature film pitching award at the CEE Animation Forum 2018 (formerly Visegrad Animation Forum). The success of this project was confirmed by receiving Nespresso Audience Award. 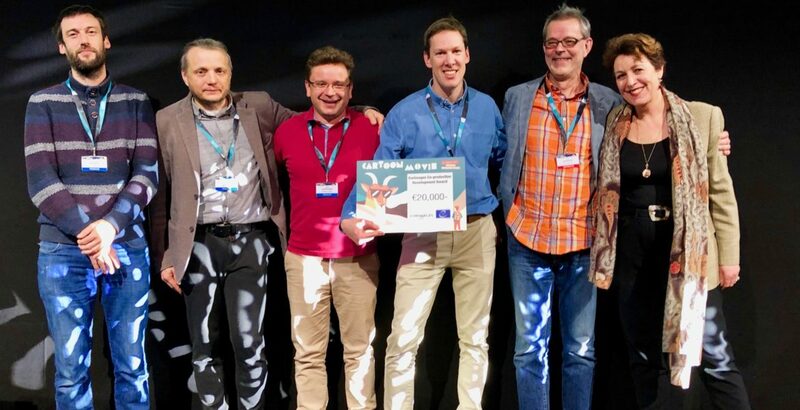 The Council of Europe’s Eurimages Fund has joined forces with ten co-production markets all over the world – and Cartoon Movie is one of them once again this year – in order to award the Eurimages Co-production Development Award. This cash-prize of €20,000 has been created to promote the Fund’s role in encouraging international animated co-production from the initial stages of a project. The project has to be designed from the outset as an international co-production for cinema release and initiated by a lead producer based in a Eurimages country willing to co-operate with other partners internationally. The lead producer should aim to involve at least one other producer from a Eurimages country. The award, which takes the form of a non-reimbursable subsidy, must be used by the producers to cover development expenses of the animation project. The Jury was composed of Dorien Van de Pas (Netherlands Film Fund – The Netherlands), Tom Carpelan (Filmkompaniet – Finland) and François Mergier (STUDIOCANAL – France). Eight international projects in development pitched at Cartoon Movie 2019 were nominated. The Jury was impressed by the project “Of Unwanted Things and People” by David Súkup, Ivana Laučíková, Leon Vidmar & Agata Gorządek and co-produced by a unique team of 4 co-producers coming from 4 different European countries: Maur Film (Czech Republic), Artichoke (Slovakia), ZVVIKS (Slovenia) & WJTeam/Likaon (Poland). They would work together for the first time with this project “Of Unwanted Things and People”. A film involving a great deal of fantasy and imagination dealing with universal and sometimes also difficult issues with both respect and not underestimating the children’s way of understanding. It is on top of that a plea for the art of storytelling. The co-producers have also a strong vision on their working process, the development and production of the film, financing and marketing.